There are 54 articles in this month. She’s in California to cheer on Mike Gallardo, an athlete from her affiliate in San Antonio, Texas. When Jeff and Mikki Lee Martin discovered CrossFit in the summer of 2003, they couldn’t get any adults interested. Kids, however, were another story. “Our kids program really started almost a year ahead of the adult program,” Jeff says. 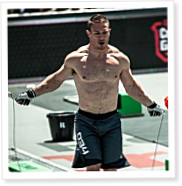 On Episode 234 of CrossFit Radio, host Justin Judkins interviewed the two athletes who placed third at the 2012 Reebok CrossFit Games: Kyle Kasperbauer and Talayna Fortunato. This episode was webcast live at 6 p.m. PDT on Wednesday, July 25, 2012. CrossFit Gymnastics trainers Jeff Tucker, Jessica Gray, Julie Barnes Maurer and Keith Wittenstein explain the many warm-up movements part and parcel to gymnastics. In Part 2, coordination is also tested with arm circles in opposite directions, followed by one-leg balances. For the balances, athletes are asked to close their eyes to work on proprioception.